As the season is starting to come to an end- we want to take a moment and recognize our third year graduating players. Many of this players will finish their regular season this week. Our Midget AA team will be having their annual Phillip Coulton Memorial Game - Thursday at 7:30pm vs Southside. They will also be honoring their third-year players. Please come out and support your North River Flames. We are looking for volunteers to sell 50/50 at the Cornwall Esso on Friday evenings and Saturday morning. This can be an individual effort or as a team fundraiser. Teams will receive 40 cents on every ticket sold. Table, chair, tickets, and pen will be at the Esso. All tickets sold must be passed in on Saturday. Flexible on the start and end times. Email powerplaydraw@gmail.com for additional inforamation. Provincial playoff schedule vs Pownal. District 16 MLA Heath MacDonald and his wife Elizabeth would like to invite you to a free family skate on Family Day, February 18th. This fun event will be held at the APM Centre in Cornwall from 10:00-11:00 am. There will be free hot chocolate for all in attendance. This is a great way to start off this well deserved holiday. Elizabeth and Heath look forward to seeing you there. Volunteer opportunities for students who are possibly looking for some Duke of Edinburgh hours, Community Bursary hours, or who just like to help out in our community. The Town of Cornwall is looking for a few students that would be interested in helping with the Learn to Skate program on Saturdays. NRMHA Sweetheart Tournament Committee is looking for a few students to assist with different tasks throughout the tournament weekend. The selection process for the 2019 Provincial Championships has been completed. Championship titles will be sought after in arenas across the province this coming March. "All of the members have worked hard to get to this stage, and determining our provincial champions is an exciting way to cap off the season. Best of luck to all teams." said Robert MacMillan, Minor Council Chairman. Championship game time schedules will be made available on the Hockey PEI Website in early March. Bantam and Midget AAA (male/female) conduct a playoff elimination format. The hockey jamboree will consist of skills sessions facilitated by the 2019 Canada Games Female Hockey Team. Participants will get a chance to interact with players, participate in skating, puck handling, and shooting skill sessions. Participants will then finish with an interactive mini game. The skills sessions will be in station format, and the players will be exposed to all skill development. Female Canada Games Alumni will also be present to work with the players, and help out with the sessions. The event will conclude with an Alumni Game, featuring past Canada Games players and coaches matching up against the current 2019 team. It will be a great day of fun, skill development, and the best of female hockey on display. All players will be charged a fee of $10 for the jamboree. The fee will be collected the day of the event at registration. Lunch will be provided. The jamboree is open to Initiation, Novice, Atom, Peewee aged female players (born 2013 - 2006). Why: Celebrate the Game & meet your 2019 CWG Female Team! For additional information, please contact the Hockey PEI office at info@hockeypei.com or (902)368-4334. Thank you so much for your participation in our weekly 50/50 Power Play Draw. The goal of this draw is to decrease registration for next year. So far over the past 10 weeks our average weekly give away has been $1,260. The amount may look good but it's not enough to hit our targets. If each player could sell or buy just 3 tickets a week we would break even. The committee will continue to do everything they can to make this fundraiser a success. We will also continue to keep you posted with additional emails in the upcoming weeks. The Midget AAA Robin's Mid-Isle Matrix team invites all students to attend a special "Hockey Fights Cancer" game Friday December 7 at the APM Centre in Cornwall, against the Pownal Red Devils. The two points are huge with only one point separating the two teams but the night has an even bigger importance as both teams are raising money for the Canadian Cancer Society. Admission for students is $2 and all proceeds go to the Canadian Cancer Society! We will also be donating the proceeds of our 50/50 to the Cancer Society. Game time is 7:40 with a ceremonial puck drop beforehand. Midget AAA Robin's Mid-Isle Matrix will be donating the proceeds, monies, from the door of their following 2 home games to the CBC feed a family Christmas drive. We will also be accepting monetary donations at the door for the food drive. NRMHA will be holding their team managers meeting on Wednesday- November 14th at 8pm...Upstairs at APM. Manager's Checklist will be updated closer to the meeting date. We ask that all NRMHA teams have a manager or team representative attend this meeting. Any teams needing a travel permit for off island tournaments for 2019, we ask you do not submit them to NRMHA till after December 15th, 2018. Teams looking to set up bank accounts- we have asked Provincial Credit Union to come to APM for teams to set up accounts on site- Date TBD. As teams are confirmed- please enter team rosters and team staff (with contact email) on your team website. See below information including dates & times for the 2018 League Meetings. Failure to have a representative (coach or manager) at this meeting or provide advance notice to Hockey PEI that a team rep cannot attend, we will assume that your association is not offering a team for that particular level of play. This meeting is important to share information regarding rules and regulations, schedules, and provincials, etc. October 29th All 'A' teams have an option to attend a league meeting in Charlottetown or Summerside. All teams must attend one of the meetings. Note: All Midget A male teams are required to attend this provincial meeting. Please pass this information along to your executive members, division coordinators, managers and coaches. Attendance is very important. Note: The following leagues will set their own meetings and advise the respective teams. A Female Coach Clinic (Development 1) will be held on Saturday, October 20th from 9:00-4:00 pm at the House of Sport on Enman Cres. Any interested females can sign up using the link below. Please share with any females 16 years of age or older that may be interested. Our first draw for our New NR - POWER PLAY 50/50 takes place this Sunday at 5:00. If you have tickets and want to be in our first draw you need to drop them off this Saturday Morning between 9:00 - Noon. For this week only we will be set up in the classroom upstairs as we are expecting a large turnout. Any white tickets that you sold please make sure you have the funds that correspond with those tickets and please label them with the week numbers between 1-20 that you are looking for the tickets to be entered into. For those that are paying by debit installments, your registration tickets that were part of your fundraising fee will be released when registration is paid in full. "Our ultimate goal with this draw is to lower registration costs in the future". Just wanted to provide you with a quick update on the status of the girls A teams. We have been compiling the lists from registration, and have updated several times through AAA try-outs, new to hockey programs, and numbers/updates from other associations. We are close to knowing numbers of teams/division, but will need to wait for AA try-outs to be completed to have final numbers in each division, so this will likely be mid-end week next week. As soon as we have the final numbers and know the number of teams/ice times, I will send out an email and post on the North River web-site. In the interim, ice times will start on Sat, Oct 20th. The following is the schedule for the first 2 ice times only - at the APM. We will post the regular weekly schedule once everything is finalized. Thanks for your patience - hope to have all this finalized very soon. The winner of the facebook Like and Share contest was Kim Nicholson Shaw. First draw is this coming Sunday October 14. Drop off for this week is Saturday Oct 13, upstairs at the APM in the classroom 9-12 noon. Additional books of tickets can be picked up at this time. If you have registered and paid in full but have not received your yellow tickets, they can also be picked up Saturday 9-12. We are now accepting names of coaches for our 'A' teams and our Tykes Program. Deadline for submissions is October 6th. NRMHA is now seeking applications for anyone interested in officiating or being a timekeeper for the upcoming Season. Applicants are required to be a minimum age of 12yrs. If interested, please forward your name, the reason why you wish to become an official, and any related experience. Please note there are limited positions available. Hockey PEI through Minor Council and the Female Steering Committee has announced that they will host a Female Jamboree for all Initiation and Novice aged female players. The Jamboree will take place Saturday September 29th at the Pownal Sports Center. The jamboree is open to all Initiation and Novice aged female players (Born 2010 or after). The jamboree welcomes all registered and non-registered players to participate. "This is a great opportunity for us to celebrate the female game as another season begins," stated Jen MacDonald Director of Female Hockey for Hockey PEI. "We invite all female initiation and novice players throughout the province to join us for the day". The jamboree will consist of skills and drills, mini games all in a fun atmosphere. Players will be grouped into teams by Hockey PEI in advance. All players will be charged a fee of $10 for the jamboree. The registration fee will be collected the day of the event upon registration. All interested players must register as individuals. The deadline to register is September 24th. In order to assist with balanced ice sessions during AA Conditioning and Tryouts- we ask all players attending to please register this season. The format will be 2 Conditioning Sessions and up to 4 Tryouts ($10/ice session). After huge successes in the first four years, North River Minor Hockey will again be offering a New to Hockey Camp for female players between the ages of 7 and 17 this fall. This camp is designed for players that haven't played organized hockey in the past, who want to try hockey in a fun non-competitive environment. Last season we had 14 new females join hockey as a result of this camp. The camp will include 8 x 1 hour sessions over 3 weeks, which will focus on learning the basics skills of hockey and the fun the sport can offer. It will be run by NRMHA coaches along with players from our female program. All Ice times are at the APM Centre in Cornwall. Any players who participate (who haven't been registered with NRMHA in the past two years) that register for the 2018-19 season with NRMHA this money will be deducted from their registration! If you are unsure of commitment to play, you do not need to register as this can be completed at the conclusion of the camp with no late fee. ** Equipment will be available to borrow for this event thanks to an Equipment Grant from Mott's Canada Dry. Details will be provided to players interested in registering. Those interested please contact by email. To Register click on the following link. The committee will be at the APM lobby from 9:00-Noon starting this Saturday to collect tickets as well as hand out more to those who need them. Twenty-five sets of hockey gear has been donated making the sport more accessible for all Cornwall, PE: Hockey players in North River will now have even more access to the sport they love as New York Rangers Defenceman and Cornwall native Adam McQuaid has donated twenty-five sets of brand new hockey gear to the organization. This "All Can Play Fund" removes financial strain from any children and their parents who may not otherwise been able to play without the gear. To receive a set, all parents have to do is contact NRMHA and fill out a form as it is on a needs basis. Sets will also be given to new hockey players who do not want to fully invest in a set of gear until they are committed to playing. The gear does not include a pair of skates or a helmet, so those must be provided by the player beforehand. The gear is then to be returned at the end of the season. Adam McQuaid played all of his minor hockey years with North River Minor Hockey Association, including two years with the Cornwall Thunder Major Midget AAA team, prior to moving to Sudbury, Ontario to play Major Junior with the Sudbury Wolves of the OHL. As for the reason for his donation, McQuaid wanted to create a way for children to enjoy hockey and remove any barriers. He wanted to give back to his community and to the association that he grew up playing in. The NRMHA Board are thrilled with this donation and would like to express gratitude to Adam for his continuous support of the organization. (Please round cheques to nearest dollar- no cents & we do ask that any post-dated cheques are as dated below). ***Online Registration*** (Please do this before coming in to register). Registration payment options - Cash, Cheque(s), or Debit (APM Canteen). We do not accept e-transfers or credit cards. REGISTRATION IS NOT COMPLETE UNTIL PAYMENTS ARE SUBMITTED. 25% OF REGISTRATION IS DUE ON SEPTEMBER 8TH-SEPTEMBER 15TH. **LATE FEES OF $50 / FAMILY WILL BE CHARGED ON ALL RETURNING PLAYER REGISTRATIONS AND PAYMENTS/INSTALLMENTS NOT RECEIVED BY SATURDAY SEPTEMBER 15th. Any member that will be utilizing the KidSport Program or Jumpstart Program- please see Patrick Butler during registration. If you or if you know someone that requires assistance for the upcoming season- please click on the link for the Canadian Tire Jumpstart Funding Program. This camp is being operated in conjunction UPEI Women's Hockey Panthers coaching staff and players and guest instructors from NRMHA and Wildcats coaching staff. Schedule to be released in late August. The camps will run approximately Sept 15 - Oct 1. Female Panther Camp - will start on September 15th. Names and Full Schedule will be released and posted within the next couple of days. List of registered players will be posted on the development page of http://northriverflames.ca on a weekly basis starting August 21. Registration not completed until payment is received. Payment may be completed by email to nrmhadevelopment@gmail.com or by payment at APM Centre canteen during business hours the canteen is open. Names will not be added to the registration list until payment has been received & refunds will only be given for medical reasons. We would like to thank all our applicants. Novice hockey will have a new seasonal structure in PEI this coming season. The entirety of 2018-2019 Novice season will use a half-ice game model that will encourage and promote development for players of all skill level. The half-ice model was introduced last year but only for the first half of the 2017-2018 season. The change to a full season of half-ice games will improve and assist with the development of Novice players by getting them more involved with the game through increased puck touches, shots, passes and transitions. At the Hockey Canada Spring Congress in May 2017, the Hockey Canada board passed a motion starting for the 2019-2020 season it will be mandatory that all games played at the Novice age level be cross or half-ice games. The same motion was also passed as a recommendation for the 2017-2018 and 2018-2019 seasons. With this change Hockey PEI is aligned with many other branches in the country who have decided to introduce modified half-ice full time for the upcoming season, including Hockey Nova Scotia and Hockey Newfoundland and Labrador in the Atlantic region. 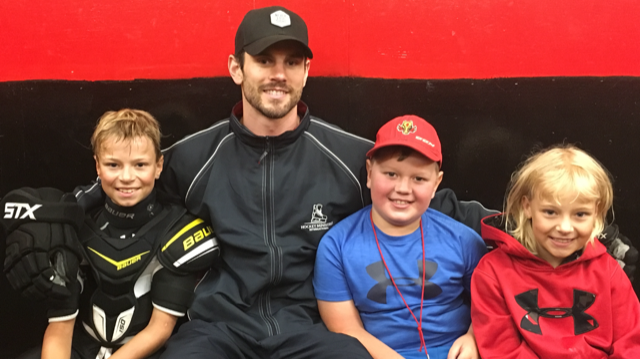 "Hockey PEI is committed to continuing to improve the delivery of minor hockey within our communities to ensure every player is getting the best possible experience they can," said Jeremy Pierce, Chair of Hockey PEI Development Council. "These changes are about developing players in a positive way and creating a fun and positive atmosphere for kids in this age category". From the beginning of the minor hockey season to November 15, 2018, Novice teams will focus solely on skill development through their team practices. Between November 15, 2018 and March 15, 2019, Novice teams will play half-ice games only. All Novice tournaments or jamborees will be played using the half-ice game model. Hockey PEI has developed a Novice Hockey Guide for parents and Minor Hockey Associations to assist with this transition. The guide further outlines specific details, rationale and the benefits of the Novice hockey program for the upcoming season. North River Minor Hockey Association is Calling for Coaching Applications for the 2018-19 season for all "AA" levels (Novice, Atom, PeeWee, Bantam, and Midget). Application deadline is July 22, 2018. Note: We ask all coaches including those with the intention to return to coach from previous seasons to submit an application so their intentions for the upcoming season are known. Below are the Mid Isle Wildcats head coaches for the 2018/19 season. Below are the Mid-Isle Matrix head coaches for the 2018/19 season. The Mid Isle Matrix AGM will be July 12 @7:00pm at the Lions Club in North Rustico. NRMHA Board is pleased to announce that Caley McDonald has accepted the President role. Caley has been part of NRMHA for a number of years, and is also the Co-Chair of the Sweetheart Tournament. NRMHA also welcomed the following people who will be joining the 2018-2019 Board. We Thank all our board members , as they put in countless hours to ensure that our minor hockey program runs smoothly as we prepare for the upcoming Season. Hockey PEI has developed a Novice Hockey Guide for parents and Minor Hockey Associations to assist with this transition. The guide further outlines specific details, rationale and the benefits of the Novice hockey program for the upcoming season. Click HERE for the Novice Guide. The Bantam and Midget AAA Leagues (male and female) will conduct playoff elimination series set by the respective leagues. The Mid Isle Wildcats Annual General Meeting will be held on May 30 at 6:00PM at the Southside Actiplex in Crapaud. NRMHA has several Board members who have completed their term, and or served many years with our organization and we would like to take this time to thank each and every one of them for their time. We continue to take great pride in our Association and we could not have done it without them. Everyone has given numerous hours of volunteer time over the past several years, and it did not go without notice. Our Association has always been a great part of our community and these individuals have had a hand in bringing Players, Parents, Coaches, Officials, and Volunteers together for the love of the Game. President - Steven Stead has acted as our President for the past three years, and has completed his term. (There were no nominations at the AGM with a replacement for President - this position will remain vacant and will now be left with Board Members). We would like to "Welcome" and "Congratulate" Sam MacPhail as our New 2nd Vice President. Many of our Coordinators have also completed their term, and many have contributed many years in their position and we wish to Thank everyone. Board Members will be filling the spots over the next few months as we prepare for the Fall Season. At this time, if anyone is interested in any of these positions, please email nrmhaassistant@gmail.com and it will be directed to the Board. NRMHA sends congratulations to our Award winners for 2017-2018. Presentations were made this evening at our AGM Meeting. Thank you to all those who attended. Coach of the Year - Tyler Matthews (absent) Novice A Strawberry Cupcakes. Thanks to all those who submitted nominations. Please be advised the AGM will be held on Wednesday May 23rd at 7pm - upstairs at the APM Centre. Deadline has been extended till April 30th. Hockey PEI is offering introductory Come Try Hockey female skills clinics. This Program will be three FREE ice sessions for females who are interested in hockey and would like to give it a try. If you are a female who is between 6-14 years old then these sessions are for you. The focus of each session is to introduce players to the basics, to make new friends, and to try the game without having to make a commitment to sign up for a season. For any questions or additional information, please contact the Hockey PEI office at info@hockeypei.com or by phone at 902-368-4334. 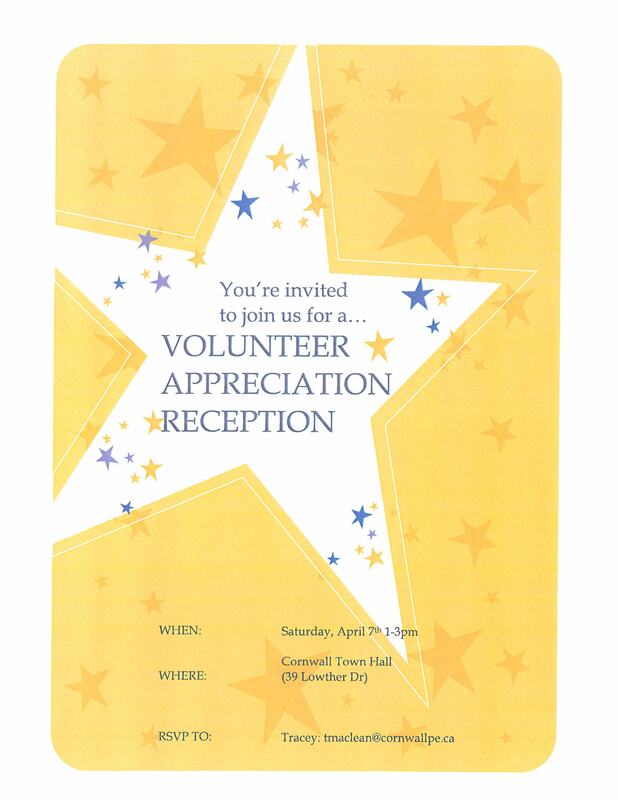 Town of Cornwall Hosting a Volunteer Appreciation Reception on Saturday April 7th from 1-3pm at the Town Hall. (Invite below). We are now accepting nominations for the 2017/2018 for our NRMHA Hockey Awards- Each year North River Minor Hockey recognizes "winners" by awarding a plaque. This year we will be presenting the plaques at the AGM meeting in May. (Date - TBD). The members of the nominating committee are requesting nominations for these awards. We are requesting that all managers notify their team's parents of these awards and encourage persons to make applications for any or all of them. We feel that the input from the parents should assist with the process of giving the awards to the most deserving persons. NRMHA would like to recognize all the graduating players from Minor Hockey for 2018. After a busy few weeks at Island arenas, Hockey PEI is pleased to announce that all Minor Provincial Champions have been declared for the 2017-2018 season. Hockey PEI and Minor Council wish to extend a huge congratulations to all participating teams and champions. Many thanks go out to the Host Communities whose dedicated committees and volunteers help shape these events and provide a great experience for all teams. Champions have been declared in 25 divisions of play ranging from Atom to Midget. A big shout out to our Atom "AA" Flames as they will be hosting the Atom AA Division at APM Centre. 2017-2018 Season Evaluation Survey - all team managers have been sent each team codes. We appreciate everyone taking a moment to complete as feedback received will assist NRMHA prepare for the upcoming season. Best wishes to our teams competing this weekend in Provincials. http://hockeypei.com/page.php?page_id=62299 for schedules and updates. It is the last regular season game for the 17-18 Midget AA West Masonry Flames where they will take on the OLeary Maroons. This game is played every year in the memory of Philip Coulton. We will also be honoring our third-year players. Please come out and support your North River Flames. The schedules for the 2018 Provincials are attached and have been uploaded to our website. Semi-final playoff schedule vs Western. The Hockey PEI Program of Excellence will be hosting a female development clinic for all Atom and Pee Wee female aged players. These sessions are open to all female players. Sessions will focus on fundamental skills in skating, passing and puck control. Maximum is set at 30 players per division. Final schedule will be confirmed once registrations are finalized. Players are asked to register a minimum of 7 days in advance of the session. Clinics open to all female players that also may be playing on a male team. This is the sign up sheet for all families in the NRMHA to donate food items to be used in the Hospitality Rooms during the Sweetheart Tournament (Feb 8-11, 2018). Please deliver your donations to the kitchen of the APM Centre on Thur (Feb 8)or Fri (Feb 9) of the tournament. Please cross your name off the donations sheets in the kitchen when you drop off your food. Please try to avoid bringing in items with nuts. Thanks for making the Sweetheart Tournament a success! PLEASE REMEMBER TO ENTER YOUR TEAM NAME AND DIVISION. Sweetheart funds are used throughout the year for all teams within NRMHA, both male and female. Development, new equipment, and even the Zamboni have been paid for with Sweetheart funds. As a result, this fundraiser requires the much appreciated volunteer work of the entire NRMHA community. Please sign up and ensure to fill out all fields including your child's team, to ensure that your team gets credit for the hours. Thank you in advance! The selection process for the 2018 Provincial Championships has been completed. Championship titles will be sought after in arenas across the province this coming March. "It is a great opportunity to celebrate the game as the season comes to an end and recognize our league champions" said Al MacIsaac, Minor Council Chairman. Note: All Female Gold Medal Games will be played in Pownal. Our Sweetheart Committee is looking for interested 50/50 Volunteers for the upcoming 12th Annual Sweetheart Tournament being held February 8th - 11th. Shifts would be for 3 hrs - with locations being at the APM Centre or Crapaud- South Shore Complex. If you are a motivated enthusiastic 50/50 Sales person and or know someone that would be interested - please email nrmhaassistant@gmail.com by January 20th. In March 2018, the International Ice Hockey Federation will host the IIHF Girls' Global Game. This year, 37 member federations will take part in a game that will be played in rinks across the globe. The Ontario Women's Hockey Association (OWHA) will be hosting Hockey Canada's game - the final stop of a hockey game that will make its way right around the world. This is the second year that players form all provinces will participate. Last season Hockey PEI was represented by Avery Bradley (Stratford) and Brianna Creed (Gaspereaux). The OWHA is inviting two players from each province to participate in this year's game that will be played in Mississauga on the weekend of March 10-11, 2018. The goal is to connect players from across Canada and around the world! Hockey PEI is now accepting applications from Bantam-aged players who are interested in representing the branch at this year's IIHF Global Game. Travel, meals and accommodations for the two selected players will be covered. Association News Used Hockey Equipment Donations Welcome!! If you/your family have any gently used hockey gear that is not being using, why not donate it and support a North River player! NRMHA would greatly appreciate your equipment donations. Donations of: hockey helmets, gloves, neck guards and sticks are in short supply. Kindly drop off any donations just inside the rink into the large bin marked "DONATIONS WELCOME". Coaches/Parents: you/players will be able to access the donated gear from the marked shelving units at the back of the rink. We kindly ask that parents and/or coaches access the cupboards in order to keep the gear as organized as best as possible. Thank you for supporting this equipment initiative! We strongly believe that with your support we will aid in having more children being able to play hockey in our community. THANKS in advance for your kindness. Last order for Fundscrip for 2017 will be Thursday December 14th for normal delivery the following week. The next order date will be Thursday January 4th, followed by a return to our normal bi-weekly order schedule on January 11th.